"The Militant Emperor of Wei 魏武帝 (wèi wǔ dì)"
The "bad" guy. The Machiavellian. The Julius Caesar of Ancient China... or at least that is what the story teller Luo Guan Zhong 罗贯中 wants you to think of Cao Cao. This guy is one interesting character; ruthless, intelligent, user of ploys and ambushes, but yet chivalrous at the same time. He treats his loyal subjects and talents with respect and admiration, yet is paranoid and fearful of assassinations. Perhaps it is due to his "unpolitically correct" way of achieving success (through ploys, ambushes, trickery and murder) that is the cause for his negative portrayal in the story. It is said that the story itself was heavily edited to downplay Cao Cao's accomplishments so as to emphasize Liu Bei 刘备's confucius-styled leadership. Either way, there is really no denying that Cao Cao is one great leader of his time and one of the most famous Chinese historical figures of all time. 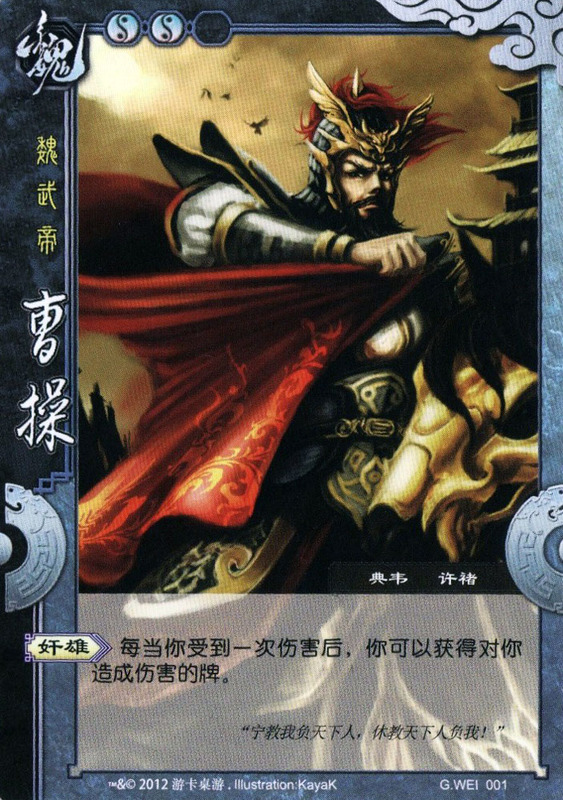 Character ability: "Villainous Hero 奸雄 (jiān xióng)"
Every instance after you suffer damage, you can acquire the card that inflicted damage on you. The term “immediately” is removed to clarify the timing of activating “Villainous Hero”. The Ruler Ability is removed. "Villainous hero" must be one of the best thought-of abilities in the game. It is not ridiculously powerful or god-like, very useful in the game, and a wonderful fit for Cao Cao's personality in the story. Every time he met defeat, Cao Cao would bounce back and bite the face off his opponents, then convince the enemy generals to surrender into his service. Such was the case of Zhang Liao 张辽, who surrendered to Cao Cao after Lu Bu 吕布 was defeated, then became one of the Kingdom of Cao Wei 曹魏's great generals. It was also mentioned that Cao Cao loves only women who have already been taken, then relish the thought of snatching the woman away from her partner.